In this week’s edition of Forward Today, Scott reflects on the importance of mountains in scripture in preparation for the Feast of the Transfiguration. Today’s Wednesday sale features The Bible Challenge. 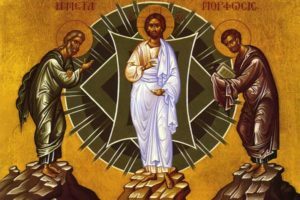 This coming Sunday, we will celebrate the Feast of the Transfiguration of Our Lord Jesus Christ. Every now and then, when this feast falls on a Sunday, we set aside our usual Sunday readings to focus on what is, by any reckoning, a wondrous occasion. You probably know the story, which we’ll hear from Luke this year. Jesus takes three of his disciples up a mountain, and there he is transfigured before them. In a stunning moment, Peter, James, and John see Jesus for who he is, the eternal Christ, the fulfillment of the law. There are lots of ways to approach this story, but this year I’m struck by how it’s really a story about new perspectives. Jesus doesn’t change. He was the eternal Christ before the Transfiguration. Jesus is the same, but the disciples become different through their experience. It’s interesting that this takes place on a mountain. Of course, the story echoes the giving of the law on Mount Sinai, which also takes place on a mountain. Perhaps mountains are on my mind because I’ve just come back from Colorado. Last weekend, I preached in Breckenridge, which is up at almost 10,000 feet elevation. It’s beautiful there, and even on the last day of July, snow was visible on the mountain peaks. The thing about mountains is that they give us a new perspective. You see the world differently as you ascend and look down. The experience of hiking (I’ve never done real climbing) up a mountain itself can change our perspective, because it can be a real accomplishment just to get to the top! So it’s no wonder that scriptures are filled with amazing encounters with God in the mountains. Here’s the thing: the disciples probably didn’t know they were going to see Jesus change when they started to hike up Mount Tabor. They just went. I wonder if we are ready to answer our Savior’s call? Are we ready to look at our world differently as we meet Jesus in the sacraments? Are we ready to see Christ’s dazzling presence in the most vulnerable people in our society? O God, who on the holy mount revealed to chosen witnesses your well-beloved Son, wonderfully transfigured, in raiment white and glistening: Mercifully grant that we, being delivered from the disquietude of this world, may by faith behold the King in his beauty; who with you, O Father, and you, O Holy Spirit, lives and reigns, one God, for ever and ever. Amen.